You can’t achieve retail success unless you’re consistently meeting or exceeding customer expectations at the point of sale (POS). But as more retail competitors pop up, customers feel empowered to demand greater and greater value for their money. That’s why POS systems for retail must deliver the features you need to keep raising the bar—and must do so at a price you can afford. Acumatica is an economical retail POS system for multi-location retailers, franchise operators, and regional and national chain stores. It delivers a centralized view of the information you need to complete the retail POS process quickly and effectively. With Acumatica, you have immediate access to information such as customer and order history, real-time order status, inventory data, and profitability by location and product. 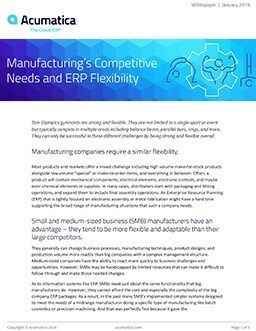 See how businesses that combine cloud, mobile, and integrated retail management technologies improve their business outcomes and ability to compete. In less than an hour, you'll hear from experts about top business concerns for retail and hear from a customer about how they are getting to the next level with systems that support growth. Acumatica’s integration services and API make it easy to integrate all your multi-channel sales environments to gain a centralized view of the business. By delivering a complete view across online sales, telesales, and retail sales operations, Acumatica allows you to optimize inventory, ordering, and profitability. You can integrate eCommerce, readers, touch screens, and all-in-one POS stations. Acumatica ERP has a pre-built integration to Fusion Point of Sale (FusionPOS™). FusionPOS is part of the Fusion Retail Management System (FusionRMS™), a full-featured retail POS system for centralized management in highly distributed retail and wholesale environments. Eliminate duplicate data entry by using multiple CRM levels to maintain individual customers’ transaction history. Update the POS without manual intervention. All items, customers, and pricing data in Acumatica ERP are automatically synchronized between the POS and the back office. Streamline your operations. All transactions from the POS are automatically returned to Acumatica Sales Order Processing for final processing. Reduce downtime by transacting business even when your internet connection is temporarily lost. Support Phantom items – groups of items that are not physically grouped are entered as a single line item or kit, but tracked within the system individually. Fulfill from any store or warehouse. Add new customers to Acumatica CRM automatically from POS. Use a configurable POS user interface. With Acumatica, you can pick up or ship eCommerce orders from any store as well as a corporate location. The results are lower freight costs, a superior customer experience, and better inventory coverage. And because all of this happens within the retail POS software, you can minimize the amount of end-user training required. 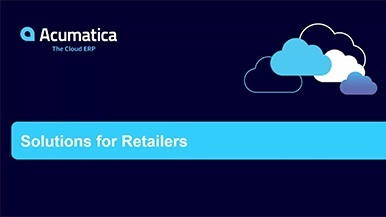 Acumatica’s retail POS system is designed to provide maximum flexibility for organizations of all sizes. The system has the capacity to handle a large network of retail stores. Below is a graphical representation of a multi-store implementation. A fully integrated smartphone Loyalty Program includes points management, geographic or store-centric coupons and promotions, and social media integration. Fusion Gift Card uses a multi-location prepayment card. Fusion Scheduler is ideal for scheduling resources in businesses such as salons, restaurants, and services.